The most recent report, picked up by the Drudge Report, concerns the first reported occurrence in Africa. The most detailed analyses of ice fall events has been carried out by Spanish geologist Prof. Jes�s Mart�nez-Fr�as, who suggests that they might be "signals of more serious environmental problems" (an allegation which is quite fashionable these days). I believe that the true explanation is much less mysterious. First, it should be noted that there is no possible way for a large block of ice to form in a clear atmosphere. Large hailstones can only form in intense thunderstorms that contain supersaturated air and large updraft speeds sufficient to keep the hail aloft long enough to collect a large amount of frozen water on its surface. Ice falling trough unsaturated air will evaporate, not gather more ice. If the origin was extraterrestrial, the ice would evaporate quickly from the heat of entry into the upper atmosphere at the very high speeds that are attained by an object falling to the Earth with little initial atmospheric drag. The only reason why aircraft have been ruled out as a source for some of these ice blocks is that either the water was not obviously contaminated from waste water that has been used in a toilet (indeed, some of the blocks are contaminated, even with the blue dye color that is added to the chemical treatment solution); or that "no aircraft was observed". But the lack of contamination argument assumes that clean water can not be leaked from an aircraft in flight, which seems unlikely. The reason why aircraft are not observed after an ice fall is likely because the jet has already traveled outside of the viewers range of sight. For a large irregular block of ice, a terminal fall speed of about 120 mph can be assumed. For a cruising altitude of 6 miles and a cruising speed of 600 mph, the ice will fall for three minutes before reaching the surface. During those three minutes, the jet will have traveled 30 miles down range, which is a distance that equals five times its altitude. This generally puts the aircraft outside the view of the observer, who is likely looking upward to see where the ice might have come from. A jet contrail might be present, but the observer likely will not connect it with the block of ice that has fallen so rapidly out of the sky. http://tierra.rediris.es/publipapers/megacryometeors_JAC.pdf Also, it is very curious that you, based on your preconceptions and without any hydrochemical analyses or study of the atmosphere or the events be so sure about what is possible or impossible regarding the origin and formation of the megacryometeors. These arguments about imposisble things have been broken many times in science, and probably you know many examples about it. The fact that we don't understand the model of formation (we are only starting to study these events), does not mean that they are not happening. But megacryometeors do fall ! Likewise, you have avoided to mention (probably without any intention) that there are MANY documented cases of similar large ice fall events which are previous to the existence (or the invention if you prefer) of the aircrafts. I hope you incorporate this message, following the ethical and scientific procedure, in your website as my right of response to you report. Anyway, if you need further information about our research, just let me know. I appreciate the need in science to be open to unusual physical phenomena, and agree that some things that once seemed impossible are now explained by science. However, I have indeed read some of the articles written by (and about) Prof. Mart�nez-Fr�as, and find the evidence for a non-aircraft origin of these ice balls to be unconvincing; extraordinary theories need extraordinary evidence to support them, and I do not see that evidence being presented. I feel fairly well qualified to critique the Professor's theory, as I have a Ph.D. in Meteorology...which unlike 'atmospheric chemistry' is the relevant field of expertise. 1: The meteorological conditions described in the article referenced above are not that unusual, as they accompany most extratropical frontal systems that occur continuously outside of the tropics. The existence of tropopause folds, jets streams, and nearly-saturated air is not that unusual, and do not constitute an explanation. 2. If atmospheric conditions were ripe for the formation of these megacryometeors, we would see many more (thousands, if not millions) smaller ice balls accompany these isolated, very large ones during an ice fall event. By itself, this fact argues strongly for an aircraft origin. 3 The lack of condensation nuclei can not explain the isolated formation of megacryometeors, as there are always abundant aerosols present in the atmosphere for the formation of hydrometeors. 4. 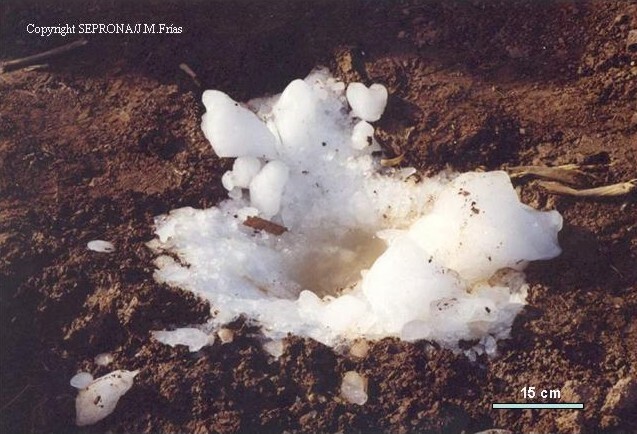 Ice hydrometeors (like hail) can not grow to these large sizes without exposure to abundant amounts of water for a relatively long period of time. Even if the troposphere is supersaturated over a deep layer, without visible cloud, the large ice mass would need to be held aloft for a very long period of time in order for a substantial amount of ice to be built up. The lack of cloud absolutely proves that there are no atmospheric updrafts capable of supporting such a mass; even a very slight updraft in saturated or nearly-saturated layer will produce clouds. 5. The layering of the megacryometeors (like hail) suggests repeated exposure to a water source, such as a leak from an aircraft water supply. 6. The claim that the number of occurrences of megacryometeors is increasing can be explained by the simple fact that there are more people spread over larger areas of the Earth to observe these rare events. (Also, aircraft traffic has increased dramatically in recent decades). Appealing to 'climate change' as an explanation for everything that we can not otherwise explain is not very convincing. 7. The claim that such ice falls occurred before aircraft were invented, and that they were not associated in any way with thunderstorm activity, would have to be exceedingly well documented to be taken at face value. Anecdotal evidence is interesting, but in situations where the claim is contrary to our understanding of basic physical principles, it can not be considered proof. I reiterate: extraordinary claims require extraordinary evidence. While Prof. Mart�nez-Fr�as might one day be proved correct, the evidence at hand remains unconvincing.